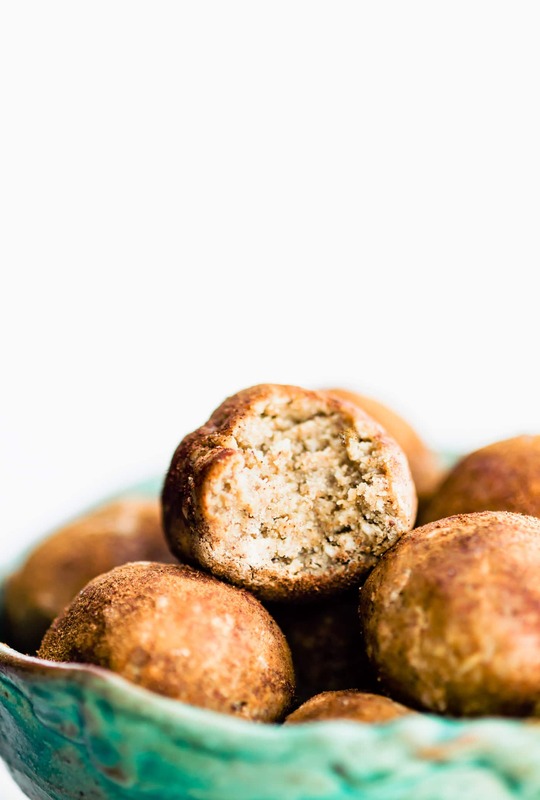 These Cinnamon Vanilla Protein Breakfast Bites are super easy to make, with NO BAKING required! Healthy, great for snacks or breakfast on the go, and kid-friendly. Learn how to make the gluten-free and vegan-friendly no-bake protein bites in my step by step video. You guys!!! We’re bringing back a breakfast “meal prep” favorite! 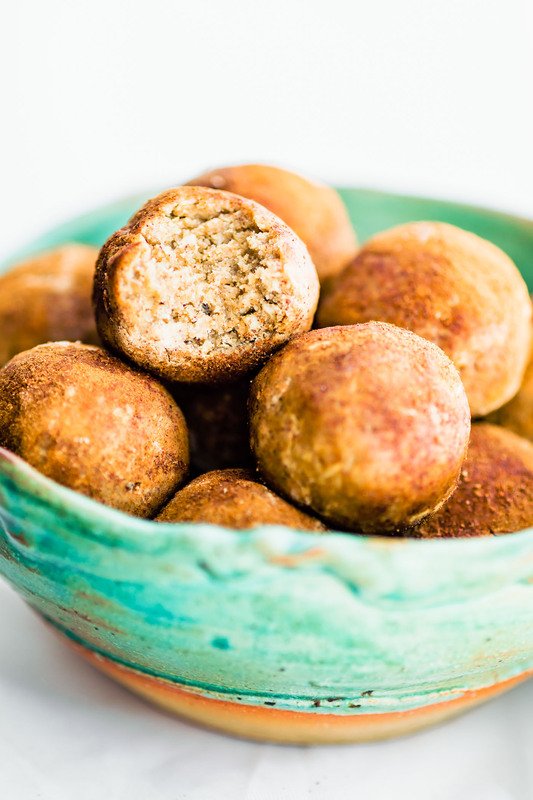 Gluten free no bake protein breakfast bites! Yep, these bites have been given a little makeover and an update, just for this post. And why I am republishing it today. 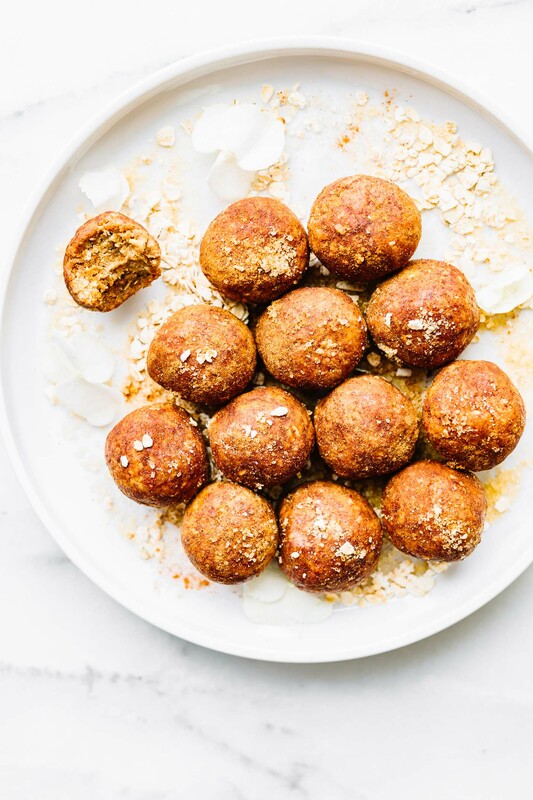 The truth is, I have been working on rewriting both of my Healthy Bites ebooks (aka no bake energy and protein balls). My first ebook was created in Spring 2009! That’s almost a decade ago. Whoa! I figured it might be time to update and upgrade. 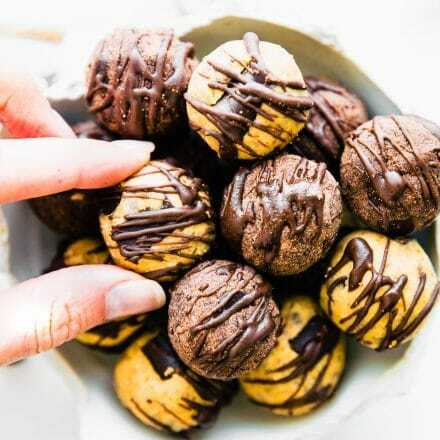 These healthy bites recipes include a ton of food allergy friendly options; vegan , paleo, nut free, no sugar, and just plain gluten-free protein bite options. All no-bake, of course. We’re-testing the recipes, tweaking the ingredients, etc. Phew, we’re ALMOST DONE! 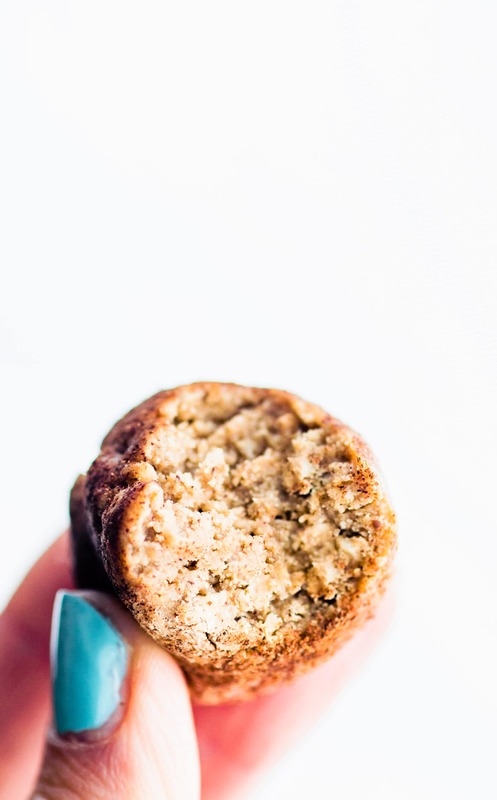 That being said, I’m excited to share one of my VERY FAVORITE no bake protein breakfast bite recipes from the first ebook and now one of the MOST POPULAR on pinterest. Need nut substitutes? Don’t you worry, I have that covered in the recipe notes below! 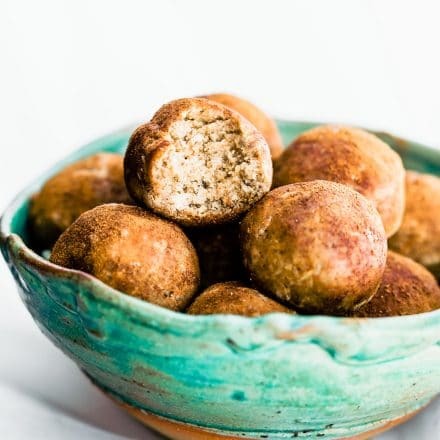 Simple, grab your favorite vanilla protein powder, combine it with your favorite gluten free cereal/oats, and then roll it all together with cinnamon and nut butter. OR you can blend it all together (minus the honey) in a food processor then transfer that batter into a large bowl and add honey. Mix and roll! In the video below (sorry it’s an oldie but goodie), you will see I have several options for the gluten free cereal base. Oats, rice crisps, gluten free Chex cereal, banana chips, etc. Whatever works, as long as you get a good base “meal/flour.” You can do that by using gluten free oats or by grinding up your cereal/granola. See above. Either way, then end result is a batch of extremely delicious breakfast bites! Similar to taste to that of a cinnamon bun.. okay not really, more like a snickerdoodle meets oatmeal cookie. Still good for breakfast, in my opinion. Let me know what you think of the video or if you have any questions about these no-bake breakfast protein bites! There are lots of easy substitutes if need be. Oh and be sure to use a CREAMY nut butter that stirs easy. That’s crucial! How can I get protein for breakfast (other than eggs)? Non-soy protein powder – I like to add it to smoothies. Try my Creamy Coconut Spirulina Superfood Smoothie or Orange Probiotic Immunity Boosting Smoothies. Quinoa – It’s super delicious anytime, but one of my favorite ways to eat quinoa is in this Creamy Vegan Pumpkin Quinoa Breakfast. 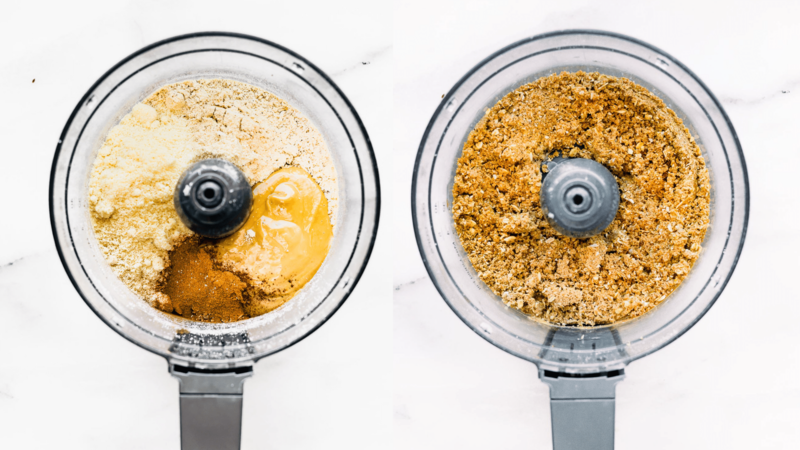 Nut butter – Peanut butter, almond, cashew, walnut – choose your favorite! Load it up onto apple slices, schmear it onto gluten-free toast, or make these Dark Chocolate Almond Butter Breakfast Cookies. Alright, I think we are fully ready to tackle a protein rich breakfast! Ready to make and NO BAKE? Gluten free, vegan friendly, and seriously so good for breakfast on the go or post workout protein snacking! 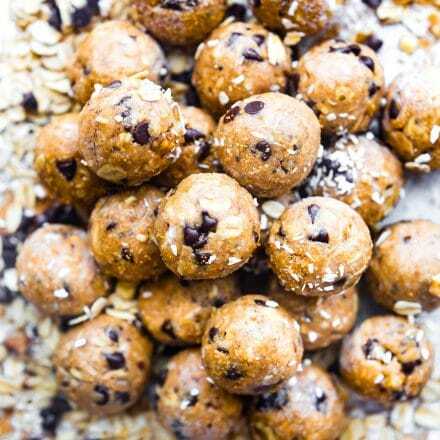 Do you have a go-to no-bake protein bites recipe? Do share! thanks liz! I will definitely try! Is the nutrition value for 1 bite or the entire batch? So about 1 bite depending on size. I usually say 3-4 bites is similar to a Luna bar or energy bar. If that makes sense? Hello I I saw in your recepie it says that honey is not vegan. Honey is Vegas because if it was not bees pollinate the flowers and fruits so that would make all the vegetables not Vegas because bees help make the plants. love the video!!! and your hair is gorgeous! Gotta make these. Sound so yummy! My son would love them! I loved watching your video!!! Did you do it yourself? I know how time consuming that is — editing, all of it! It turned out great! It’s also fun to see you “in person” and hear your voice. Mwah! mwah to you! and my husband helps when he can. I also have a friend help (who i pay). He is taking on a few more people if you are interested. haha so funny. I will probably start imagining their voices. I have met a lot of my blogger friends IRL so that helps! And thank YOU! lets meet soon, mmm k? What a cool video! Now I want donut holes for breakfast. You are so clever, my friend! These look INCREDIBLE! Definitely my kind of breakfast! Yay that it’s no bake! These look great before and after a workout, a snack, dessert or on the go! Quick question: I saw the nutrition facts, which were awesome, but what is the serving size? I might have just missed it too lol. These look so good, thanks for the recipe. it’s per bite. So i usually think of 3-4 bites equivalent to like a protein bar or cliff bar. 3 would be around 230- 240 calories 10 grams protein. Does that make sense? If you make them small then they of course are less calories but also less protein. totally up to you. How did I NOT know that you have a YouTube channel?! I’m so glad that I found it–subscribed! I cannot wait to try this recipe out!! I used to have an older youtube channel but i started over, from scratch, this year. EEK! Seriously you are too cute! 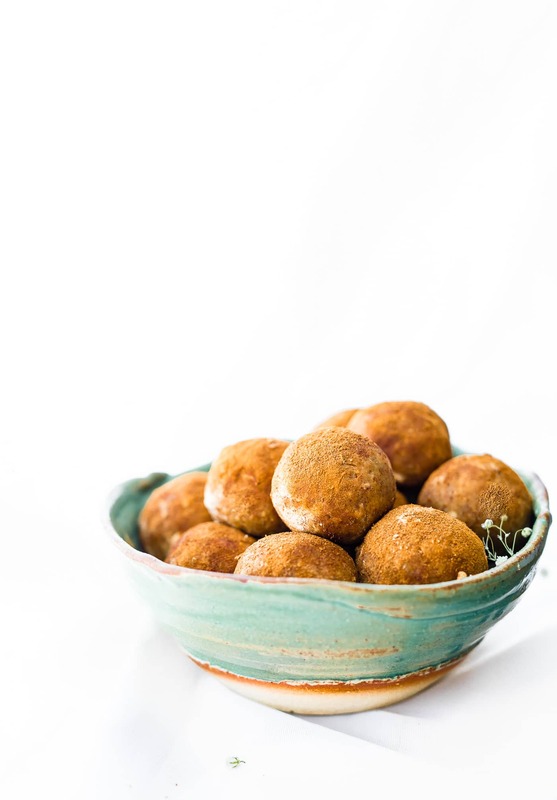 These bites, balls, whatever look like legit donut holes only I would love these and I’m not a fan of donut holes! hehe yea donuts! I mean bites! These look delicious! Do you think it would also work with agave nectar or maple syrup instead of honey? totally! i’ve used both a lot. It might be more or less, just depends on the thickness of the agave/etc. yes, you can use those too. The agave is a littler thinner so just FYI. I would add 1/4 cup at a time to see how it rolls best. If that makes sense? Have you ever used a melon baller?! I used agave instead and they were very good! My kids asked for more the next day! Her comment below may help as I noticed mine were very sticky and a bit difficult to make. I hesitated to make them again for this reason but would try another time with her suggestion. Thanks for your feedback. Did you use more agave or less? I want to make note of this. I usually have to add more flour to adjust. Glad your kids liked! Can you leave the protein powder out? Any recommended substitutions? Can you use coconut flour instead of the peanut flour? you can but you will have to adjust honey and nut butter because coconut flour is more grainy. Still works though! Keep me posted! Vegan or can you tolerate whey isolate or collagen? So each bite is 3 grams of protein? Yes! About 3-4 would be equivalent to a protein bar. Does that make sense? I actually found one – Vega one proteins and greens (it has to be the “and greens” version though!). Thank you! I supa LURRRRVVVVE these cinnamon-vanilla-pb bites – having had the pleasure of sampling some of them – I honestly cannot say I’ve tasted any that I didnt LURRRRVVVVE! oH AND I supa LURRRRVVVVE the video!!! Loved seeing your gorgeous mug as you fixed these bites up! I made these just now and they are superb! Dry iingredients first in blender, added ppeanut butter, and added honey by hand worked out wonderfully. I purchased all dry ingredients from bulk bins by weight and the calorie content matched from my estimations at the store… but do you have any tips for measuring calorie content of products by weight instead of by cup/tbsp? Wonderful! So glad. Have you tried calculating in Spark Recipes? I know they sometimes have ingredients listed per weight. Let me know! Being on an elimination diet, it can be hard to find things to eat to satisfy my sweet craving, fill me up and stay clear of foods I have to avoid. These babies did the trick! They are super easy to make and absolutely delicious. The only change I made was using only 3 tablespoons of honey and adding a splash of almond milk to bring it all together to be able to form into balls. These will be great as an after run snack! Thank you for sharing! SO GLAD! thanks for sharing those tips. Did the Almond milk make them mushy at all? I don’t think they’re mushy. I only used a tablespoon or so and I used GF Cheerios (1 1/4 cup) instead of oats. Are there are any lower calorie substitutes you can add in or substitute for some of the peanut butter and honey? I would like to get these to a higher protein concentration. Sure! I’ve used xylitol syrup endorse in place of honey but it’s a little more liquid like so adjust the quantity needed. You could also try using a bit of peanut flour mixed with a tiny but of almond milk or water instead of part of the peanut butter but you will need a good binder. I might try playing with that. I will let you know if I do as well. Let me know what ingredients you have on hand and I’m sure I can help! 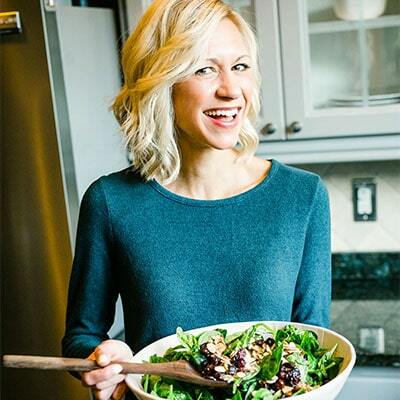 Thanks, I personally want to avoid the xylitol as I am fine with them tasting less sweet, but there is already peanut flour or almond meal in the recipe – so would just add more of the meal and counter with a bit of nut milk? I am somewhat new to not following a recipe strictly but I was thinking egg whites might work well without changing the taste too much. Any other good binders? 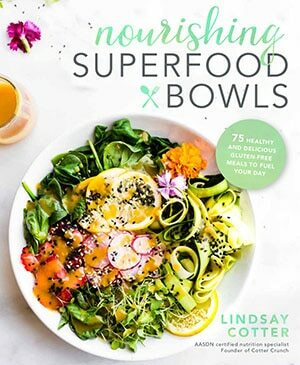 Interesting recipes for bites, specially knowing they’re healthy. I wanted to ask about your method of calculating the nutrition facts list. Not sure if I’m doing it right though. I usually say about 4 protein bites are equivalent to a bar. Around 250 -270 calories or so and 10-12 grams protein. Hope that helps! Hi! These look delicious!! I don’t suppose you know any nut free alternatives to this? It’s so hard to find decent protein bars/bites when you have a nut allergy! Thank you for this!! I will change the font for sure. As far as nut free goes, you can totally use an oatmeal that’s ground up instead of almond meal. Or a coconut flour. Or even ground pumpkin seeds made into a flour. Then use sunflower seed butter. Adjust the amount of honey you use. Could be more or less with different flours. Does that make sense? sure! you can try using ground almond if you have them or GF flour. YOu just might have to adjust the honey/nut butter ratio. If you using a natural nut butter, it might get dry fast. I would try making this with a fresh batch of nut butter and adjust the honey. Does that make sense? Oh my goodness! These taste similar to a Snickerdoodle. Mmmm mmmm mmmm. Thank you so much for sharing this recipe. I found you on Pinterest and I’m looking forward to reading through your site. We have two little first graders, and I’m always searching for delicious and nutritious snacks for them. This is definitely a keeper! We don’t use flavored protein powder, so I added a bit extra vanilla extract and honey (to make up for the difference in plain protein powder). I also didn’t have any almond flour, so I ground almonds with the rolled oats until fine. We use a tablespoon-sized cookie scoop to make prep. work go by faster- we make a lot of bites. Thank you again for sharing! Wonderful! Those changes are perfect. Glad it worked out!! Let me know if there is anything else you’re looking for Theresa! Hi! My son is new to food allergies. Is there a protein powder that is Soy/whey free? He has a long list of very common ingredients that he cant eat. so i am looking at making him all homemade food. he’s also only two and struggling with eating new things. so we are hoping that eliminating foods will help him want to eat more! Hey there! Sorry to hear about your son. I can relate. I use vega, sun warrior, or growing naturals for vegan soy free protein. Do you want links? Loved the Cinnamon Vanilla Breakfast Protein Bites! Was looking for something my teenage boys could grab quickly in the a.m., and not have to work for a breakfast. Results: They both LOVE them! I used some honey, peanut butter, crunched up oatmeal squares cereal, pea protein powder & followed your other ingredients. YUM! OMG…. I just made these. I was expecting them to taste like a ‘healthy-sweet’ snack (I’m sure you know what I mean, ‘healthy-sweet’ is not like ‘real’ sweet). I was blown away! 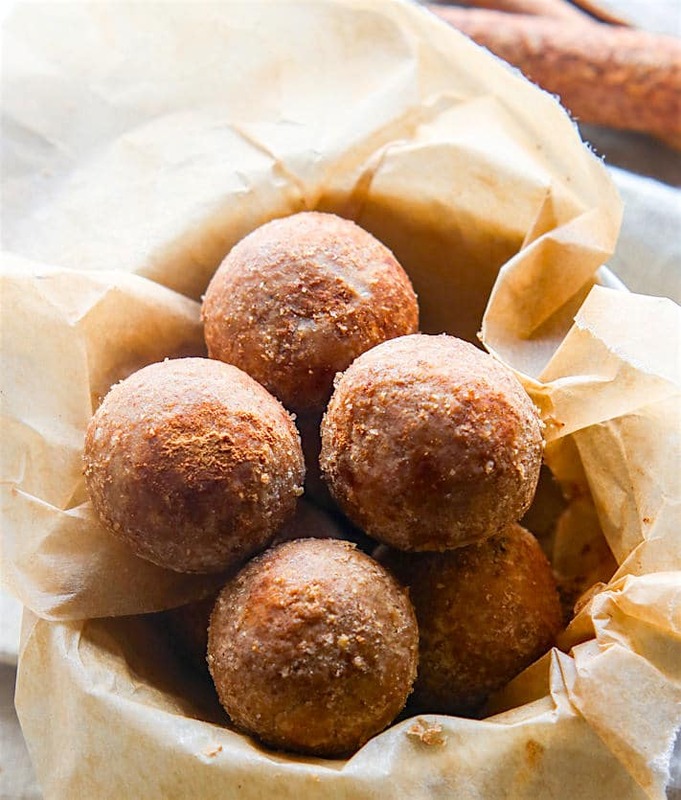 These almost taste like cinnamon donut holes! I didn’t even add the cinnamon and protein powder coating, I was worried it would be TOO sweet. And you should know something about me–there’s usually no such thing as too sweet! oh yay! so glad. Yes, this is one of our favorites. Kid approved! Would the recipe still work as is without the protein powder? you might have to add more almond flour or coconut flour to make up for it. Or any flour really. Do you have that? Yes I can add more of the coconut flour…would you say the same amount of extra coconut flour that you would have used in protein powder? Actually I wouldn’t add as much. Coconut flour absorbs a lot of water fast. Add a little at time to see how the batter forms. Does that make sense? I’d love to try these! One question. Is there a grain-free substitute for the oats? 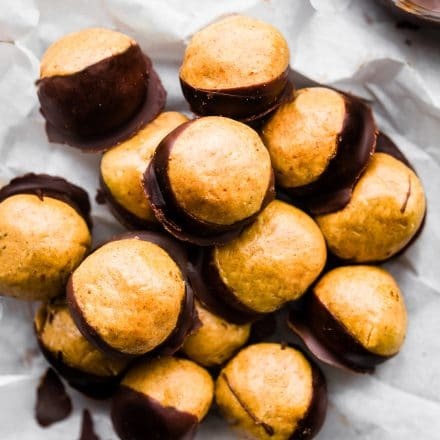 you could try using chickpea flour, almond flour, or coconut flour. YOu might need to adjust the nut butter/honey ratio though. are the oats just normal old fashioned rolled oats? I’m not gluten free, so not concerned with that, but not sure what quick oats are. I used quick oats that are smaller and thinner. But you can use rolled oats, just might need to grind longer. Does that make sense? Nevermind! I see it now! It’s the last ingredient! Can we eliminate the maple syrup? I no longer eat sugar and thought there might be enough sweetness from the protein powder and the nut butter? They might not hold very well, but you can sure try. Or have you used the xylitol syrup? That works too! Oh no. so sorry! It seems like everyone’s protein powder or additional oats are different in textures, so you have to adjust the honey/almond butter accordingly. Did you use smooth no stir almond butter? I find that binds best. For vanilla, 1 tsp is great. I will update. THANK YOU! Thanks for sharing…I made these this weekend and it came out perfectly. But I used coconut flour instead of oats and threw some fennel powder, flex meal and used agave syrup instead of honey. Yummy. I’m confused because coconut sugar, coconut, almonds, and certainly regular cream are all on my doctor’s list of high FODMAP foods, and therefore, I can’t have them. So, how is this a low-FODMAP recipe? Hi Rachel! Sorry for the confusion. This recipe is low fodmap friendly depending on the stage you are at with introductions. Using almond meal and maple syrup in small increments. I don’t have cream or coconut in it though. I think it just depends on what your doctor says. I work with several Low Fodmap Nutritionist and they all say it depends on the person. I am happy to send you their information if you’d like! These protein bites are AWESOME!!! I have tried a couple different protein bite recipes and this is by far my favorite. My husband also loved them and said the same! Woohoo! so glad.I know, they taste like donut holes. Hehe! or I am bias. Your ingredients do not include an amount for the Vanilla Exteact. I am wondering how much the recipe calls for. Please and thank you. Oh I will fix that, thanks! I use anywhere between 1/2 tsp to 1 tsp. I used chocolate Cheerios instead of the oats. That are a little healthier. I also used chocolate whey protein powder. Good Stuff! Thanks for the recipe. Oh i love that idea! thanks shane! I used chocolate protein powder and butter extract because those are all I had and this was still super delicious!! Delicious. So it is easy to guarantee the domino lunch. Thanks for sharing. 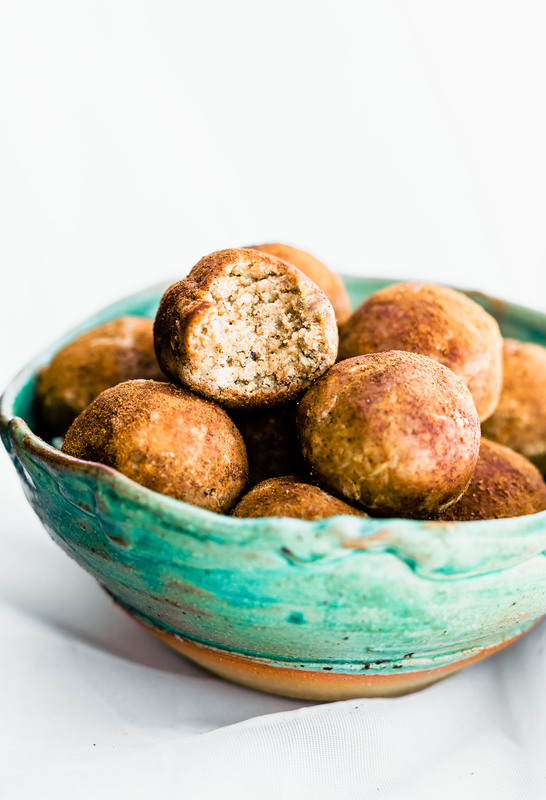 I am looking to find the actual recipe of the cinnamon vanilla no bake protein bites but it is not on the blog. Just the pictures and comments are on. We have a nut allergy in the house. Any suggestions on a flour substitute? We have our soy nut butter. Sure! Can you use pea protein or oat flour? I can make oat flour from oatmeal. Have done this before to make granola bars. Same amount? I just made these and my daughter and I love them. I made one change. I added confectioners sugar (swerve and arrowroot powder) as a sprinkle on top. They were great without the sprinkle, but amazing with it. Oh that’s a great idea! Thanks for the tip Terri! I just made these tonight.They are AWESOME!! I was worried a heaping tablespoon of cinnamon would be too much, but it was perfect! Thank you for this recipe. I’m really in to making my own protein bars these days and this will be one of my regulars. Yay! So glad. We love that cinnamon spice! I just wanted to say THANK YOU again. 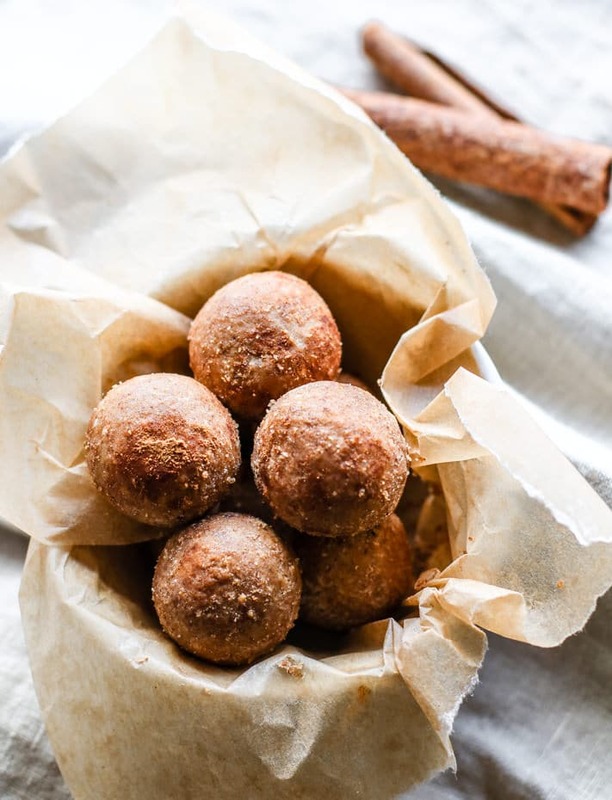 It’s been about two years and we are STILL making your delicious cinnamon bites. They love finding them in their lunchboxes as a delicious (and nutritious) sweet treat. Thank you again, for still helping me feed my kids tasty and healthy snacks. Love these so much! Cinnamon is my fav! Super simple on busy mornings! I have egg whites chocolate powder would that work? Yes! For sure. What brand? Delicious!! I used ground up pecans instead of the almonds. I’ll definitely make again!! oh i am so glad! and love the pecan substitute! Brilliant but need to double the quantity as they are already all gone! Replaced the protein powder with additional almond meal and perfection. Glad you loved them Beverley!! thanks for the feedback. Are you looking for a smoothie? These protein balls are delicious! I used cashew butter it was a little dried out so I added a splash of almond milk. 1/3 cup of honey is best I also used the quick oats. I will definitely make these again! OH yay! I am so glad you liked it! Thanks for the feedback Jenn! Gorgeous pictures! That texture in the middle looks so dreamy. Drooling. Little bites of sweet, delicious, wholesome goodness. And I love your electric blue nail polish. These were so good! I need to have a stash on hand at all times! This looks so very delicious!!! Breakfast is probably my favorite meal, so this is perfect! I think you’re gonna love these! So handy to have on hand when you need a quick (but tasty😉) breakfast! 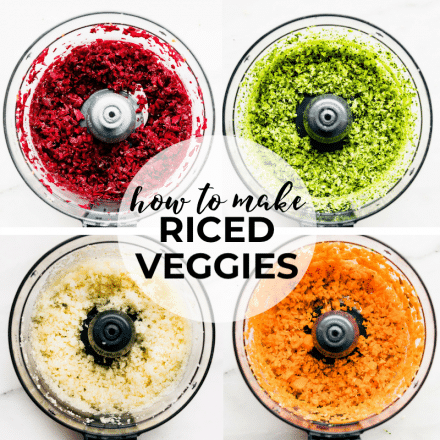 Talk about another recipe that will probably be SUPER addictive for me! Imagine if I made this with a maple pecan protein powder and date syrup. OH MY GOD, I would annihilate the whole batch throughout the day! maple pecan protein? OMG form where?! LOVE this flavor combination! Such gorgeous photos, too! Love a simple-to-make healthy bite to keep you going, especially on those crazy days! These are SO good! I’ve made them 3 times in the last week, and I can’t stop eating them! oh wonderful! I love them so much too Jenn! Just made these, turned out great!!! I love a good healthy snacks that’s easy to make!!! -ran out of cinnamon so complemented the cinnamon with allspice and nutmeg. Oh yay! Love the nut free option and extra protein. Thanks for the tips Mel! Just discovered this recipe. Looks amazing!! Going to try it tonight! I’m trying to stick to Keto – looks like everything is ok except for the oats. Did I read another comment correctly that coconut flour is a good substitute? Any other suggestions? Thank you!! I think someone has tried it with coconut flour, yes! And then xylitol syrup. But the amounts will vary due to consistency. Maybe try flaxseed (milled) in combo with coconut flour. Thoughts? So good and my kids love them!